Had I reviewed this album a week ago, I would be writing to you now with different things to say, in a wearier tone, with a harsher analysis. Converge, Rivers of Hell didn’t feel as massive as Funerals From The Astral Sphere, as wildly adventurous as Firmament, as fresh as Below The Crevices, as crushing as The Stars Would Not Awake You. I was disappointed, but I kept my ear to Hades’ subterranean currents, and the longer I listened the deeper their spell crept into me. Converge, Rivers of Hell is a carefully woven together concept album, not exactly a split. While Tempestuous Fall, Midnight Odyssey, and The Crevices Below are all distinct musical entities, they spring from the same source: Dis Pater, the enigmatic Australian behind all three. 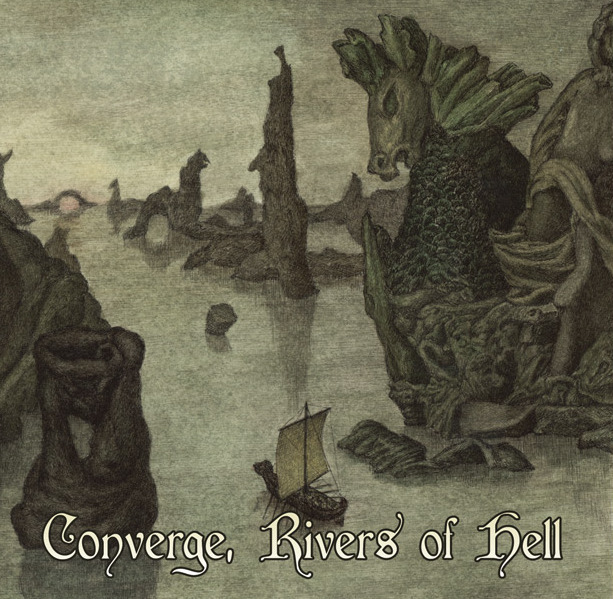 Converge, Rivers of Hell brings all of Dis Pater’s voices together on the same album, focused around the tributaries that run through the land of the dead in classical thought. He’s a production wizard. Lush, gorgeous synth lines spill out of his sleeves; organs, sonorous horns, shimmering glimmers of aural light, mysterious pitches and nebulous waves of flowing, washing, ebbing electronics. He keeps a digital drum-kit hidden in his boots, and he makes it work. A treasury of guitar tones hide in his pocket; deadweight heavy or astrally light whenever the situation calls for it. A host of voices await conjuration in his vocal chords: growls, howls, laments, and hymns awaiting their moment to speak. Converge, Rivers of Hell is no different, other than it’s nature allowing this to be Dis Pater’s most diverse work as of yet. He’s an excellent craftsman of song and weaver of sounds. The Crevices Below tracks are perhaps the best example of this on Converge, Rivers of Hell. They fluctuate from subtle dark ambience to Katatonia-esque melodies, from eerie doom drags-into-the-grave to glinting electronics, from depressive cold-wave to sinuous tremolo melodies that would fit right into a less aggressive In The Nightside Eclipse. That he puts all these things into his songs wouldn’t count for much if it wasn’t for a brilliant sense of songwriting; these tracks wend their ways through calm waters, choking rapids and neck-breaking waterfalls of progressions in all the right ways. He doesn’t repeat himself. From Midnight Odyssey‘s The Forest Mourners demo onto Tempestuous Fall‘s The Stars Would Not Awake You, Dis Pater has yet to release a single album that sounds quite like any other. Even within Midnight Odyssey, his project that’s seen the most releases, changes both radical and low-key separate each album from the next in style and character. Converge, Rivers of Hell bears the tradition still. The Midnight Odyssey songs incorporate sinister Death in June acoustic strumming, some heavier riffing, and a generally more dynamic and to-the-point approach to the vivid, synth-heavy black metal visions of the cosmos codified on Funerals From The Astral Sphere. Tempestuous Fall has seen some of the biggest changes; “Pyriphlegethon”, rich with synthesized horns and organs, swelling with chorale vocals and depth-scraping growls, bearing the listener into the deep with solemn synthesizer dirges and, for lack of a better term, epic melodies; carries a Summoning gone death-doom vibe in its tired heart. The Crevices Below tracks change less dramatically; they’re mostly just better. ~ by jakemoran on October 30, 2013. Samples on I Voidhanger are really promising… Beautiful cover art! This entry was posted on October 30, 2013 at 7:22 pm and is filed under ALL REVIEWS, C-reviews, M-reviews, T-reviews, Uncategorized.You can follow any responses to this entry through the RSS 2.0 feed.You can leave a response, or trackback from your own site.